Click here for accessing the Research Project Memory of Vanished Population Groups in today’s East-Central European Urban Environments. Click here for dowloading the brochure „What is to be remembed?“ on Chișinău [p. 6-16], Czernowitz [p. 16-30], Lemberg [p. 30-49], Wroclaw [p. 49-62]. This entry was posted in Czernowitz, Education, Internet, Photos, Politics, Travel, Ukraine and tagged Bukovina, Czernowitz, Galicia, Travel log on April 10, 2015 by Edgar Hauster. This entry was posted in Internet and tagged Digital Archives, Galicia on July 16, 2013 by Edgar Hauster. This entry was posted in Art, Internet, Photos and tagged Bukovina, Galicia, Travel log on May 7, 2013 by Edgar Hauster. Just received this E mail fro a former Campulung resident now living in Israel. The Shoah of the Romanian Jews, there are some pictures of Czernowitz . I hope somebody has the skills to translate to English from the Hebrew. It’s to complicated for my skills with Computers. This is a PowerPoint presentation, so you will need a PowerPoint viewer to see it. This entry was posted in Holocaust, Internet and tagged Digital Archives, Romania on January 23, 2012 by mechel. 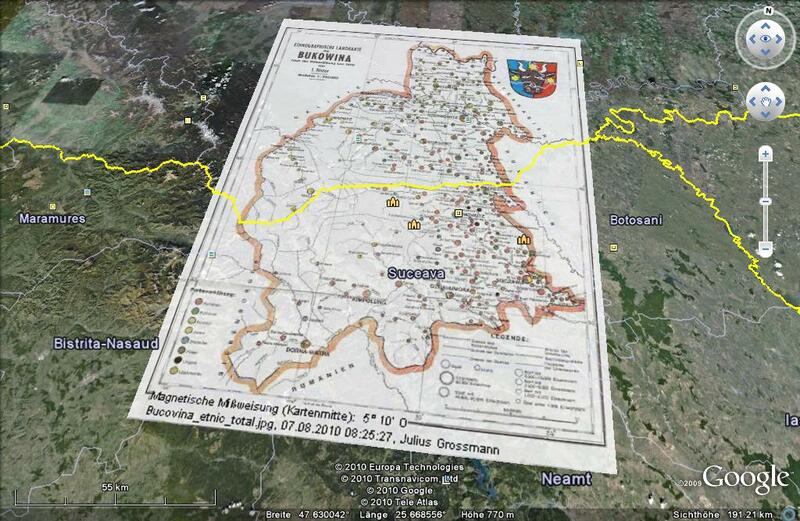 In May/June 2010 Julius Großmann from Heidelberg in Germany made a journey through Poland, Ukraine (including Czernowitz), Moldavia, Romania, Hungary and Austria. Nothing of note? Sure! It was a BIKE RIDE: 24 stages (Czernowitz = stage no. 6 on p. 17 – 24), cycling 3,600 kilometers with 23,000 metres in altitude. Incredible! His illustrated trip report (in German) is available for download here. colorful, with wonderful 3-D effects and lots of clickable pictures is now online! 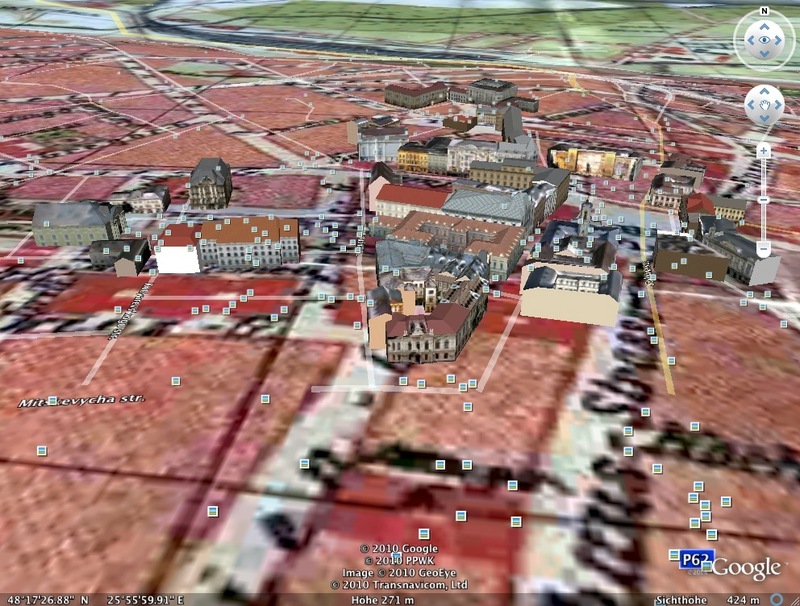 Click here in order to download your Google Earth (kmz) file and open/run it with Google Earth. 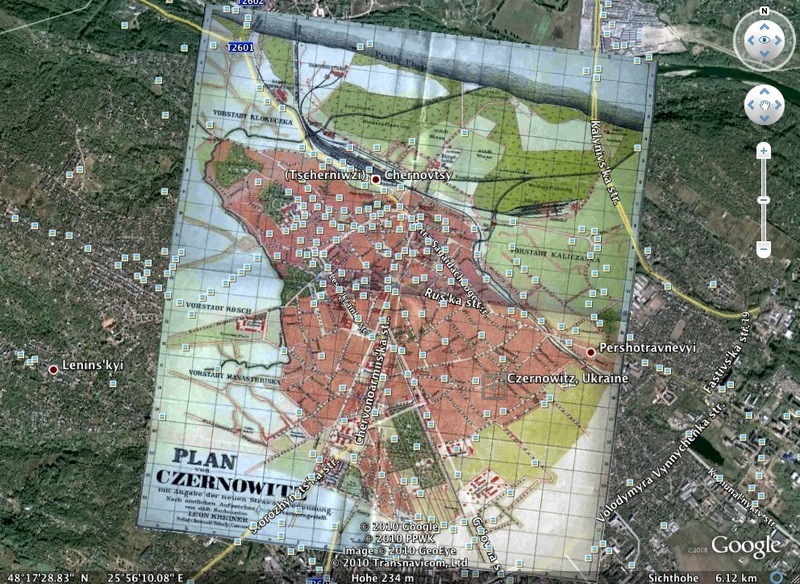 You will get map views as displayed below and you’ll be able to navigate, simulating a sightseeing flight over Czernowitz. Thank you, Julius, our “flight captain”! Press “Shift” and “Page Down” or “Page Up” to adjust the viewing angle. Zoom in or out by pressing “+” or “-“. Turn left or right by pressing “Shift” and “Home” or “End”. Click on any picture dot in order to enlarge the pictures along the roads. Enjoy the sightseeing flight over Czernowitz! 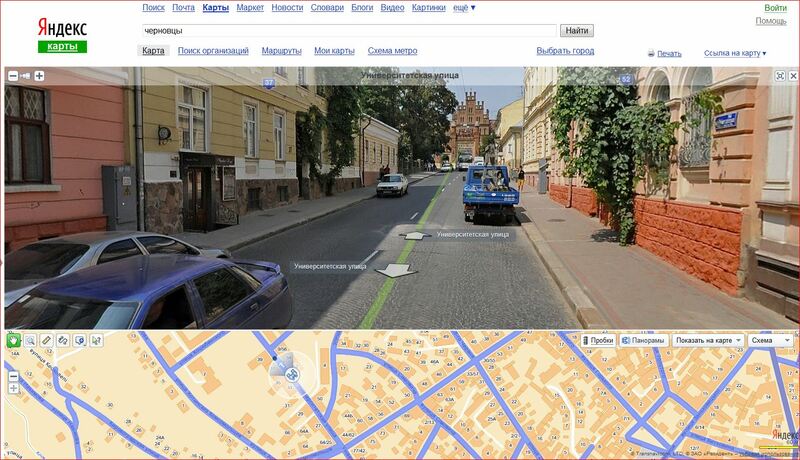 This entry was posted in Internet, Maps and tagged Czernowitz, Digital Archives on August 5, 2010 by Administrator. This entry was posted in Education, Internet and tagged Bukovina, Galicia on September 28, 2009 by Administrator.